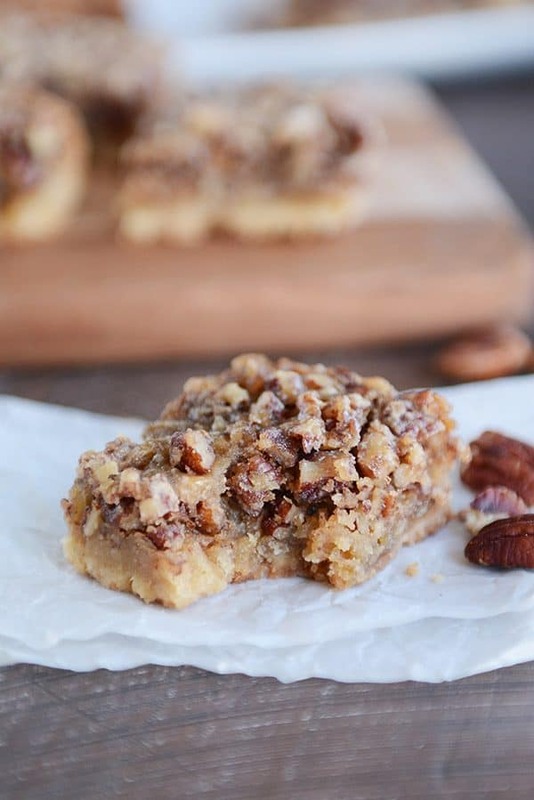 These easy pecan pie bars are amazing (as in, move over pecan pie)! That tasty buttery, shortbread crust is topped with the classic crunchy, sticky, sweet pecan filling and baked until golden. Yum! I’ve realized over time that people either love pecan pie or they hate it. Where do you fall on the pecan pie spectrum? Anyone out there who’s just “meh” about the whole pecan pie thing? In keeping with the “fudge theme” from Monday, I guess this week I’m all about posting recipes for foods that I haven’t been crazy about in the past. Because I’m a nut-avoider for most baked goods (these white chocolate pecan blondies are a notable exception), I never really gave pecan pie the time of day until this chocolate pecan pie came into my life. That pie single-handedly made me a believer that I could actually love pecan pie. Because of that, I’ve been itching to get a really great, really easy, really delicious pecan pie bar recipe up for you guys (and ok, for me, too). There’s something about that buttery shortbread base that kind of beats out pie crust any day. Both in terms of ease AND deliciousness. Sorry, pie crust. The truth hurts sometimes. Throw on a classic, sticky, sweet, crunchy, decadent pecan pie filling over the crust, and you have some of the best pecan pie bars ever. For someone who really doesn’t like to take on dessert if there’s no chocolate in sight, I could not get over these bars. I kept cutting off tiny pieces here and there until I realized I should have just carved out 1/3 of the pan. I mean, seriously. Own the serving, right? But…for chocolate lovers, there’s an easy fix. Toss a cup of chocolate chips (dark, always) in the filling before baking and you’ll have a really stellar chocolate pecan pie bar. As much as I love chocolate, this classic, no-frills version for pecan pie bars is fantastic. And I’m guessing you might even convert some pecan pie naysayers along the way. Preheat the oven to 350 degrees F. Line a 9X13-inch pan with foil and lightly grease with cooking spray. Set aside. For the crust, in a stand mixer fitted with the paddle attachment or in a bowl using a handheld electric mixer, beat together the butter and brown sugar until creamy, 1-2 minutes. Add the flour and salt, and mix until combined. It will be crumbly (might be easier to finish the mixing with your hands). Press the crust mixture evenly into the bottom of the prepared pan. Bake for 10 minutes until just barely golden. It will bake longer with the filling. For the filling, in a large bowl, whisk together the melted butter, brown sugar, maple syrup, cream, salt, and eggs until well-combined. Stir in the pecans. Pour the filling evenly over the crust, using a spatula to make sure the pecans aren't clumped up in any area (just get them as evenly distributed as possible). Bake for 20-25 minutes until the edges are starting to set and the mixture is bubbling. The middle will still be a little jiggly but will set up as the bars cool. If the middle seems overly soupy when the pan is shaken gently, bake for another few minutes, but keep in mind you definitely want to take the bars out before the middle is set. Let the bars cool completely before cutting into squares. These are delicious at room temperature or chilled. Chocolate Variation: add 1 cup chocolate chips (my recommendation would be semisweet or bittersweet) to the filling before pouring on top of the crust. ﻿I haven't tried it, but I'm guessing that light corn syrup might sub well for the pure maple syrup (although if you have pure maple syrup, the depth of flavor it lends this recipe is amazing!). Perhaps it’ll solve itself tomorrow, but just in case thought I’d try to notify you. Sorry for the inconvenience! It was just a temporary error – my website was down for a bit this evening due to some technical issues but everything should be displaying ok now. Let me know if you continue to have issues accessing the recipe! Hi Mel! Thank you for being such a culinary godsend — your recipes are always spectacular AND reliable (a hard combination to find)! You painstakingly test (and retest) these recipes so that we don’t have to, and you make us look like rockstars in the kitchen! Question: For the crust here, do you think I could brown the butter to take these bars over the top? I appreciate your thoughts! Thanks so much, Caitlin! You are a sweetheart! 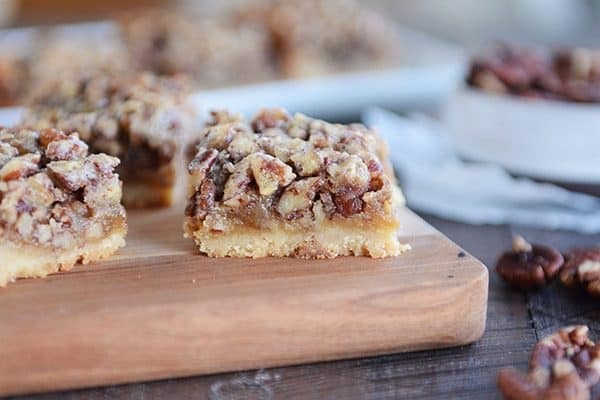 And yes, I think browned butter would be phenomenal in these bars! I use this shortbread crust, but then top it with your chocolate caramel pecan ‘pie’ recipe. It is the best of both worlds (pie and easy to serve/ eat bars). I have made these heavenly treats for two different charity auctions and boy do they go quickly. Thank you for such delicious recipes! Hi would this recipe work if I halved it and put in a 8×8 pan? If so, any guess on cooking time? The layers may be different thickness, but it should work ok. I’d probably cut 5 minutes off the baking time. When is the foil removed from the pan? Does the foil get in the crust when it is cut? I just peel back the foil when I cut them. You could use parchment paper as well. This is just pure goodness! Oh my goodness, these were amazing. I subbed walnuts for pecans (only because I had them on hand) and added dark chocolate chips. Thanks for another winnwr of dessert! Hey Errin – the cream acts as a thickener and for texture – because it has more fat than milk, it works better for the filling. I really don’t know for substitutions…you could definitely experiment with sour cream, especially if it’s full fat and not lowfat. Do you usually cut these when they’re cold? Or do you cut them, then refrigerate them? I could not get mine to look as pretty as yours! Tell me your tips! I usually cut them at room temperature and then refrigerate. But they should cut well (and maybe a bit cleaner) cold. Hi Mel, is it possible to indicate salted vs non-salted Butter in your recipes? I would really appreciate it! Hi Melissa – I always use salted butter. I just made these tonight. I make your chocolate caramel pecan pie every year for Thanksgiving, and it’s one of my favorite pies, but it is a lot of work. These were SO easy! I did the chocolate chip variation. My husband was going on and on about them and said these are as good as your pie recipe. Thanks for a great recipe! 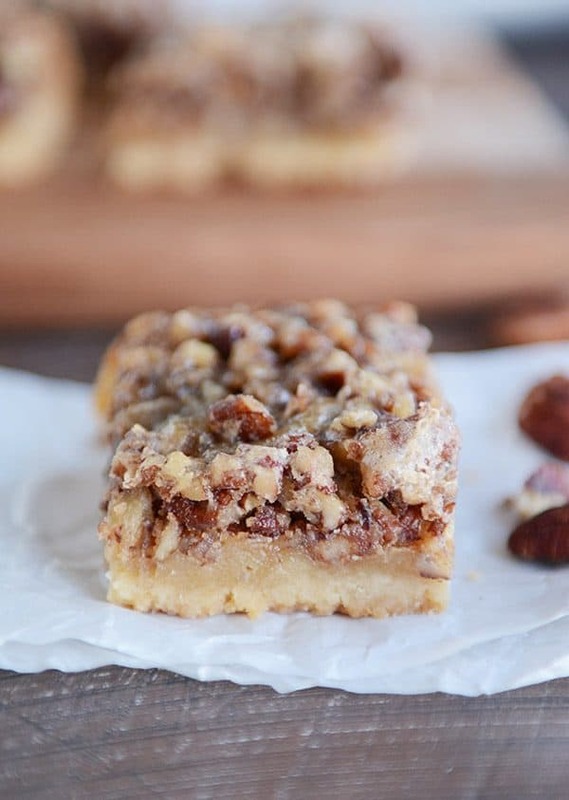 I have never had a desire to make pecan pie, but these bars looked so tasty that I couldn’t resist, and I am glad that I didn’t for they were delicious. I made a half recipe in an 8 x 8 pan, and I used dark brown sugar for the filling. Thanks for a terrific recipe. Outstanding dessert! Wow, this was really good and easy to make. Thank you! Hmmm, I haven’t had that happen, Marcy. What type of pan did you use (glass or aluminum)? Maybe pressing the crust just slightly up the sides next time could help. Filling immediately after taking the crust out and the crust shrank. Delicious but messy. I need to try again. Oh my. I made these for a potluck at work. These are wonderful – rich and buttery but I cut them into small squares and they are not over-the-top sweet. When my boss found out I had made them, he grabbed the last three pieces and said “those are SO GOOD”. I did have to bake them a little longer because the center was obviously “soupy” but my husband liked the very center pieces that I felt were not quite done. So, something for everyone! I will definitely make this again. It’s an easy recipe to throw together and everyone loved these bars. Thank you, Mel! These were delicious!!! I think this is our new favorite dessert right now! I baked it for twenty minutes, chopped the pecans into smaller pieces, and added vanilla & a splash of Jim Beam to the filling. It was great!!! I loved the flavor, but I felt that the pecan filling had a jelly type consistency after baking. I baked it for about 35 minutes, but should I have gone longer? I actually wonder if less time would help that texture out a bit? Divine! We didn’t get them made soon enough to cool completely before we ate them, so we enjoyed them warm with a scoop of ice cream on top. Oh, so good! Delish. I took them out of the oven a bit too soon so it was difficult to cut them even once they were chilled. I’ll know better next time. And there will be a next time! Thanks for the report back, Beth! These are to die for!! I added a 4 oz bar of chopped semi-sweet baker’s chocolate and it was perfection!!! You can never go wrong with the addition of chocolate! Glad you loved them! This is indeed, a 5 Star Recipe! Made as written. Everyone loved it. Our son, who usually does not like sweet things, said, “Mom, you have to bring this to our Christmas Eve dinner!” Thank you, Mel, for such a wonderfully delicious recipe! That’s the greatest compliment, thanks, Judy! I was meh about pecan pie until I made one with maple syrup, and realized I was not crazy about corn syrup really. 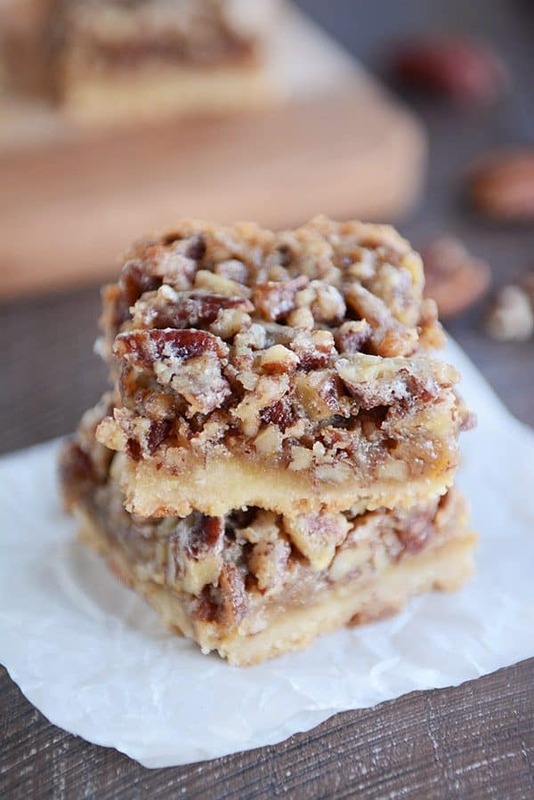 Pecan bars are much simpler, love this recipe Mel! Yes! I think that might have been my problem, too, Paula! Our family loves pecan pie, so I was very excited to see this recipe. I made them today, and these bars are awesome!! The shortbread crust with brown sugar has wonderful flavour, and the pecan filling on top….. delicious! So pleased to have another great recipe for upcoming holiday get togethers! Thanks! That made me so happy; thanks, Nancy! These. Look. Divine. Love the use of maple syrup. Wondering if they could be made 2 or 3 days ahead. If so, would you store them in the fridge or just in a cool place? I haven’t made this recipe yet, so I can’t rate it, but I will once I have! Will be making it to the letter – the only fair way to rate a recipe, to my way of thinking. Only recently found your site. Will visit it often. Hi Judy – I think these could definitely be made two days ahead of time. I’d store in the refrigerator and then take the out an hour or so before serving. Good morning, Mel, Thank you for your reply. I will make these today, then, for dinner on Sunday. Everyone will love them, I’m sure! The crust alone looks delicious . …..forget dinner! Maybe we’ll just have Pecan Pie Bars! Can’t wait to make this recipe! These are going to my husband office party! I’m hoping they are perfect cause I don’t have time for a trial run! They sound so delicious and I’ve never had a recipe from you not be absolutely divine! Thanks and happy holidays! These look delicious! I get how the maple adds depth, and I do have pure maple syrup on hand, but do they really shout MAPLE or is it just that richer depth of flavor you notice? I like maple syrup on French toast, but not used heavily in other things. I’m putting these on my list. I have decided this year to make all new to me recipes for Christmas cookies, in an effort to bring back some of the joy for me! Hi Kendra, no, these don’t have a strong maple taste at all! Hope you reignite some of that joy trying new recipes! Can I double the recipe and bake in a rimmed baking sheet? I haven’t tried that, but I think it should probably be about right in terms of amounts. No corn syrup, yay! 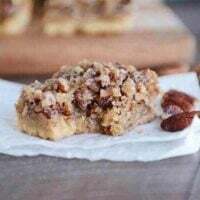 I used to LOVE to make pecan pie bars but gave them up (and kinda forgot about them) when pecans got too expensive and I swore off corn syrup. Maple syrup is a great alternative…but it is pretty expensive in my area. Maybe I’ll pay my kids to shell some pecans and try making these with molasses. I’ve done that with pecan pie before and it has a different, heartier flavor but is good! Molasses sounds like a great idea! Would half and half work instead of the heavy cream? I feel like making these this minute but am lacking one ingredient! I haven’t tried that, but I think it’d probably be fine! These were amazing, as are all your recipes! The half and half worked just fine. However next time I might cut the sugar in the filling a tad, they are very rich and sweet, which I love! But my husband isn’t as big a sweet tooth as I… Thank you MEL! Thanks for checking back in, Jocelyn! Any recommendations for using a GF flour with this?? Does GF flour usually sub well for shortbread-type recipes? If so, you might be able to use a cup4cup-type GF blend and give it a go. These look delish! Do you think they would ship well enough? I think they stand a pretty good chance of shipping well! Yum! Do these freeze well? That’s a good question, and usually I have a good answer, but I don’t know with these bars…I haven’t tried it. My inclination is to say yes with the caveat that I haven’t tried it yet. I’m pretty meh about pecan pie. I can eat it, but it’s not my favorite, and it’s so caloric that I usually choose something else. Plus, pecans are so expensive that I’m unlikely to ever make it myself. Good thing you have so many other awesome dessert recipes! By the way, I feel the same way about cilantro. They say you either love it or hate it, but I can take it or leave it. Interesting about cilantro! I get the whole “meh” over pecan pie. I’m like that with so many other things. Yummmmmmmmmm!!! I made pumpkin pie bars (with a pecan shortbread crust) this year instead of pie and it’s so much better ! Oh my heavens. These look delicious. I love shortbread and pecans. I need to try these. After I finish eating the flaky cinnamon rolls I made on Sunday. Oh gosh, those flaky cinnamon rolls. Seriously, the best. Firstly, Have you tried toasting your pecans before you add them to your filling? America’s Test Kitchen recommends it to develop the pecan flavor. Secondly, When my mom lived in Virginia 40 years ago she was given a Southern pecan bar recipe. 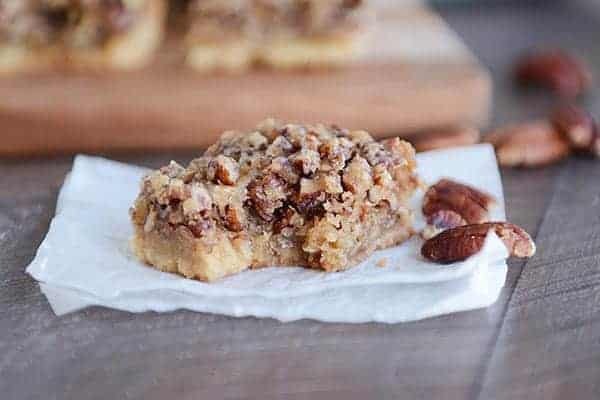 The shortbread crust has crushed pecans in it and it adds an amazing pecan flavor to the pecan bars. The next time you make pecan bars you should try this shortbread crust with your recipe. Below are the ingredients for a 9 x 13 pan. Mix and par-bake as in your recipe. Alas, Mel! I love pecan pie but have just been taken off all good things like butter, salt, and sugar! If only your recipe had come in three weeks ago before I saw the doctor! And trust me everything in the world is made with them so food has had to be pretty basic for me ! But I will make it for family and friends, so thank you for the recipe! Are there any reductions that can be made in sugar, butter or salt ? Thanks ! I also used to hate pecan pie…until I tried your chocolate caramel pecan pie recipe! Now it’s one of my favorite pies and I make it every Thanksgiving! I’m looking forward to trying these!